Occasionally, we get the go-ahead to do super-geeky articles that probably only reflect our own personal fetishes. I usually do weird Beetle variants, and today's no different. This one is particularly interesting, since it's one of the few cases of an out-of-production car being resurrected. Here's the story: Beetles had been built in Brazil for years, but, facing pressure from more modern designs, both VW's and competitors', production was halted of the original air-cooled Beetle (Fusca in Brazil) in 1986. But, just like their relative the cockroach, Beetles never really die. Brazil was in a period of economic upswing in 1992, and the formerly closed Brazilian auto market was opened to imports. While this gave Brazilians more choices, there were fewer low-end options for middle class Brazilians to buy. Soon after his inauguration, President Itamar Franco went to the Sao Paulo auto show and was dismayed to find that the cheapest new car available was about the US equivalent of $23,000 — a good deal too much for a large portion of the emerging Brazilian middle class. Itamar was determined to have a good, cheap car available to the middle class, and their benchmark was the old VW Fusca, which, of course, had been out of production for over six years. The Beetle had such a strong reputation in Brazil that Itamar eventually decided that the best course of action would be to start making them again. There's rumors that he decided to push for restarting Beetle production for his own personal desire to have a new Beetle, or, even more compelling, to please his ex-girlfriend Lislie, who owned a 1981 Fusca. None of these were confirmed, of course, and the end result is that the Brazilian government soon convinced Autolatina, the VW-Ford holding company that built the Fusca, to rework the car and give it another go. The government provided agressive tax incentives to get small, cheap cars from a number of manufactures on Brazilian roads, but a loophole proved their Fusca-favoritism: for any water-cooled car, the tax breaks were only valid for engines of 1.0 L or less. That left a nice big loophole for the Fusca's air-cooled 1.6 L engine to drive through. The technical changes to the reborn Fusca are very interesting to VW dorks like myself, as they add up to what may be the most advanced air-cooled Beetle ever made. Development was interesting as well, since instead of building test mules, the factory just bought good-condition used Bugs to test with. These "Itamar" Fuscas retained the archaic pre '65 Beetle main body, with its thick window pillars, but most everything else got a refresh. A whole new dash, with strangely-modern rounded-rect instruments, new more modern seats and other interior bits from VW's more modern line-up, a standard dual-carb engine with gasoline and a slightly more-powerful (though still just under 60 HP) Alcool version, designed to run on Brazil's sugar cane-alcohol fuel. There was also a catalytic-converter exhaust system with the exhaust exit in the fender, and, incredibly, ABS brakes. For true VW nerds, there's details like the fact that this series of Beetles is the only one ever to have the round VW logo on the rear of the car. Restarting a production line after so many years dormant is not easy; many of the original machines had been sold to parts manufacturers, so VW just bought them back when they could. 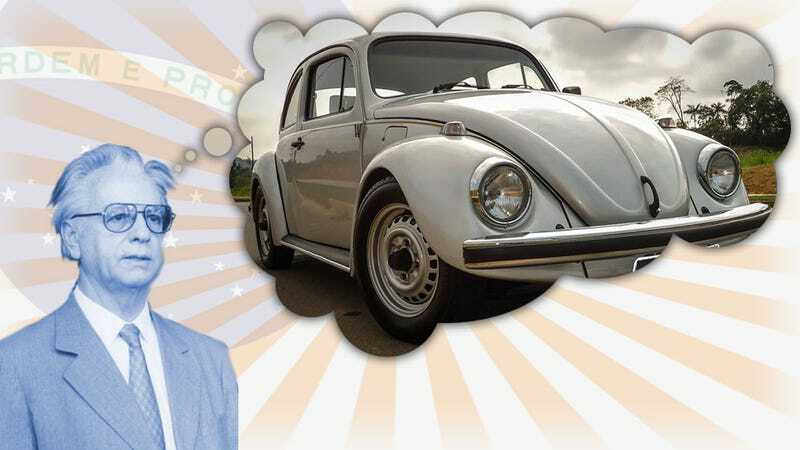 The Beetle assembly lines were put back together, and in the end they managed to sell the car for about US $6500-$6800, making it one of the cheapest cars available in Brazil. Production continued until 1996, when, with Itamar no longer president and more modern designs close in price, the old Beetle became (again) no longer a viable competitive option. Still, it was something of a success, coming back from the dead and being the impetus to get a decent low-end car market going again in Brazil. The Itamar Fusca pictured here is from the father-in-law of Leonardo Contesini, a writer for Jalopnik's Brazil branch. He tells me it was purchased for around $6500 US back in 1995, and is the entry-level version. A fancy, smoked-lights last edition was made in 1996 to commemorate the last of the Brazilian Beetles. Or, more accurately, the second time of the last of the Fuscas.